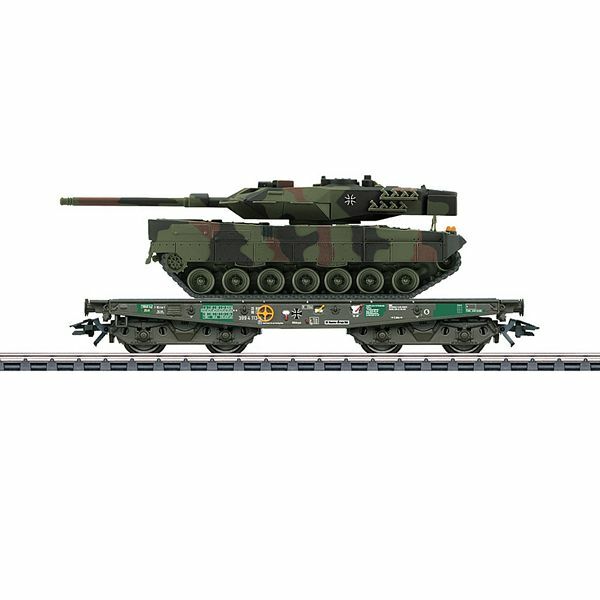 Prototype: German Federal Army type Rlmmps heavy-duty flat car loaded with a German Federal Army Leopard 2A6 attack tank, used on the German Railroad, Inc. (DB AG). Model: The heavy-duty flat car frame is constructed of metal. Load restraints are included. The model of the military vehicle has a detailed tank, superstructure, and chain units constructed of metal. Additional separately applied components are made of detailed plastic. The turret and the weapon are movable. The unit is authentically painted. It is also lettered with identification markings. Length about 8.9 cm / 3-1/2", with the cannon about 11 cm / 4-5/16". The military vehicle model is supplied by Schuco. Length over the buffers about 12.4 cm / 4-7/8". DC wheel set E700580. New item not released yet & discontinued by Factory. Backorders taken only under stand-by condition.